HAHAHA, I was waiting for the picture to load and was trying to figure out why the girl was so lucky (I could only see the top of her head) and then it finished and I was like OOOHHHHHHHHHH...... I want one! Hey, Kirsten? Do you know if you can give us any insider info about when Kiki #3 is coming out? Pleeeeeeaaaase???????? With a gummy eyeball on top? yes i have sooooooo many broken, half used crayons! now i can have fun wit them and entertain my younger cousins!!!!!!!!!!!!!!!!!!!!!!!!!!!!!!!!!!!!!!!!!!!!!!!!!!!! life is good! Hehe, when I first saw the special treat for dinner guests, I thought it was spaghetti stuck into ear plugs! But then I realised it was a hotdog and spaghetti, so then they looked like squids! Hehe. My little sister has a large, um, herd of my little ponies, and was horrified. Now I want to get those for her. Imagine the joy! A mob of zombie ponies feasting on Minty's brain's and tearing Pinky Pie limb from limb in the public square ... Mwah-hah-hah-hah! I *love* the Study Ball. I LOOOOOOOVVVVVVVEEEE the my little zombie horses! Mostly because I always hated the my little ponie things! Kirsten, i have a question. is there a Kiki Strike out in the German Language? I LOVE THAT PONY! My sister loves My Little Ponys. I should TOTALLY buy her one of those for Christmas! HAHAHAHAHA! Where do I get them, Kirsten?! PEACY: Amen! I can just imagine it! The ponies are out playing in the fields when a bloody hoof comes out from the ground and drags them to the underworld! OH, THE JOY!!!!! Good times, good times. "When not in use as a study aid, it’s a pretty decorative item that’s the perfect accessory for any room in your home." ha ha. Thats so cool, but I actually can concentrate pretty well normally. That is so insane!! I love it!!!! Well, the car was a little creepy... But anyway. I really liked the zombie ponys!!! I made crayons like those a few years ago, except I mixed colors together to make swirls, and I made them in mini cupcake dishes instead of candy molds. The study ball is pure torture. I would NEVER consider it if I had children. EVER!!!! The worst invention I've ever heard of. 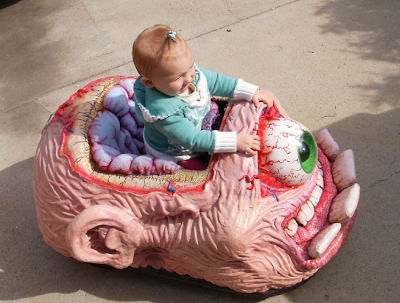 The only thing going through the child's head would be "Dammit, 2 hours left. Maybe I should just take a nap.."
People should study because they WANT to. Not because they have some giant bowling ball attatched to their ankle. This will make them think of ways to escape study time. I know what I wan't 4 xmas now. I'll ask Santa for a my lil zombie pony LOL. peacey Thats a good Idea makeing the zombie ponys eat the other "Wearid" ones rofl. insides of the "my little pony"
i could only wonder what little devil would want one of those for her b-day. 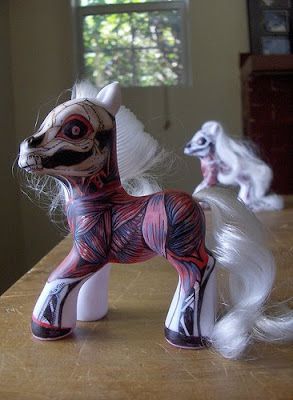 I love the zombie ponies! also the study ball.